The Upright Japanese Yew, Podocarpus macrophyllus, also known as the "Buddhist Pine," is an upright growing, oval to columnar shaped shrub with handsome, dark green, needle-like evergreen foliage which provides a unique texture in the landscape. It can grow to 20 feet in height however responds very well to shearing and is often trimmed into a formal columnar shape at 8 feet or more in height. 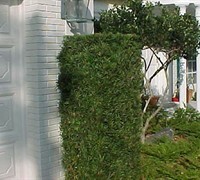 When trimmed into a formal shape, and/or to control size, the Upright Japanese Yew is useful in foundation plantings to provide height on the corners or to accentuate an entryway, or between windows to fill a void on an open wall. When trimmed into a tight column it's perfect for narrow spaces. In landscape beds it can be useful as a background, formal or natural hedge, as a stand-alone specimen, or "limbed up" to form a very attractive evergreen trree. It can also be grown indoors as a houseplant. The Upright Japanese Yew is easy to grow in well-drained soil and full sun or part shade. It does not like wet feet and is very drought and heat tolerant.